OSWEGO – Oswego Health welcomes four board-certified colon and rectal surgeons from Colon Rectal Associates of Central New York. Providing care are David Nesbitt, MD, Michael Moffa, M.D, John Nicholson, MD, and J. Alan Ziegler, MD. The board-certified and fellowship-trained physicians are providing colon and rectal cancer screening and care of anorectal disorders in Oswego Hospital’s modern seven-suite surgery center. They have office hours two days a week in suite 1300 of the Fulton Medical Office Building, 522 S. Fourth St., Fulton. “Oswego Health has grown as a progressive, high-quality healthcare system with exceptional facilities and staff and this opportunity allows us to treat Oswego County residents,” said Dr. Nesbitt. 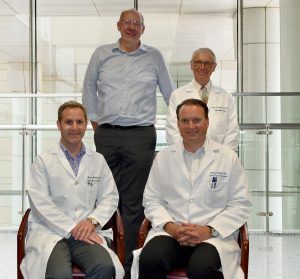 All four physicians have completed intensive colon and rectal fellowship training: Dr. Nesbitt at Washington Hospital, in Washington, D.C.; Dr. Moffa, at The Cleveland Clinic Foundation in Cleveland, Ohio; Dr. Nicholson, at the University of Minnesota, Minneapolis; and Dr. Ziegler, at St. Vincent Health Center, Erie, Pa.